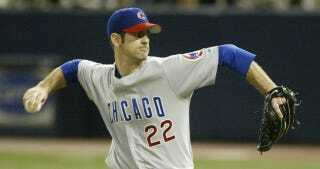 It's hard to believe that despite all the comeback attempts from former Cubs pitcher Mark Prior, he hasn't actually pitched in the Major Leagues since the summer of 2006. Since then, he's tried to latch on with the Padres, Yankees, and Rangers, never once making it to The Show. Now the Red Sox are the 31-year-old's next stop on the comeback trail. Will Prior ever pitch for the Red Sox? Probably not, but with the inconsistency of Boston's pitching in this first four weeks, Ben Cherington really doesn't have much to lose. That's also due to the fact that the Red Sox are actually playing well again, having won seven of their last nine games. But as the Journal's Jason Gay points out, some narratives just won't play, so let's just all make like it's a sweaty-palmed desperation reach by a rookie GM whose team is flailing and no hope is in sight, save for a former Cubs phenom who spectacularly flamed out.